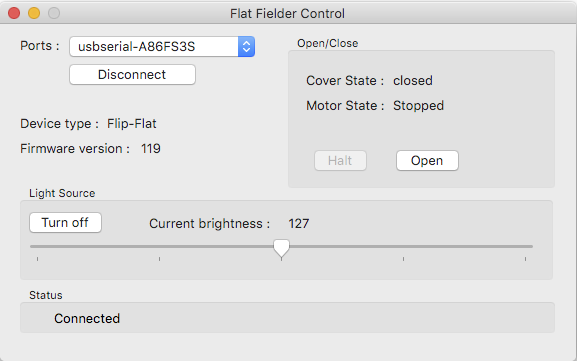 FlatFielderControl allows you to connect to an Optec Flat-Man or Flip-Flat and control it. For the Flip-Flat, once connected you need to hit the close button as the device doesn't know it's closed and won't let you turn the light on until it's closed (as reported by the Cover State in the dialog box). You will also need to install the latest FTDI drivers for OS X : http://www.ftdichip.com/Drivers/VCP.htm. Both the application and the sources are available bellow. If you want to contribute, contact me so that I can give you access to the git repo. 'Optec', 'Flat-Man' and 'Flip-Flat' are registered Trademarks of Optec,Inc. All pictures and/or material on this page is the property of Rodolphe Pineau. Unauthorized use and/or duplication of this material without express and written permission from the author and/or owner is strictly prohibited.